Technological innovation has revolutionised the workplace in terms of dimension, working hours and the very way we work. We are talking about Workplace 4.0, where digital signage is a fundamental component of corporate relations and business. It is no coincidence that we are seeing the multiplication of solutions used in the reception area, next to the lifts, in the corridors, near the coffee machines and in the refreshment areas as well as in meeting rooms themselves. Workplace 4.0 means the transformation of the workplace: it is no longer chained to the desk but rather to a series of technologies associated with digital transformation and, in particular, the new concepts of Industry 4.0. These include mobile, cloud, Internet of Things, Big Data Management and Artificial Intelligence, to name but a few. In fact, digital development has an impact on the entire world of work. Thanks to technological innovation, individual productivity and business productivity now overlap and it is not only our working methods and hours that are changing, but also the workplace itself, both in terms of fruition and dimension. When it comes to the world of work, digital signage is a fundamental aspect of development, as a window of communication between technological intelligence and people in the real world. The workplace 4.0 naturally benefits from a system of touchpoints, both fixed and mobile, that support users in multiple activities. Today, for example, you can send or receive emails and messages, write, draw, call or chat using different devices (personal or company-owned): not solely PCs, smartphones and tablets, but blackboards, tables and interactive totems. Increasingly unified and pervasive communication facilitates collaboration and exchange. The capacitive screens that characterise digital signage 4.0 are designed to be installed in various strategic positions and integrated into dedicated architectural structures. By pooling available information, organisations can make the most of content management and collaboration solutions, using various digital signage solutions to diversify the contact points for corporate relations and business. This is how inter- and intra-company communication changes pace. Welcoming visitors to the company with a digital signage solution, whether full-wall, multi-screen display or totem is much more than a dynamic and attractive furnishing strategy. The objective of the workplace 4.0 is, after all, to increase communication. Within the industrial world, the ability to plan different types of content makes it possible to display information on events and product launches, live metrics that report on company performance or social media feeds showing brand reputation, for example. Transmitting videos, weather information or daily curios, on the other hand, enriches the reception with additional contextual information. Digital signage becomes a multi-functional solution with added value if used as an interactive device to help users with geolocation. This applies to both employees and visitors. The option to alternate marketing messages with additional support services is a crucial feature of the workplace 4.0. The display can extend beyond a simple map of the rooms and common areas. It is possible to provide information about the location of meetings, seminars, conferences or any other type of event in a far more appealing and interesting way. Digital signage is winning technology not only because it is aesthetically elegant, functional and attractive, and will guarantee more brilliant and positive communication every time. 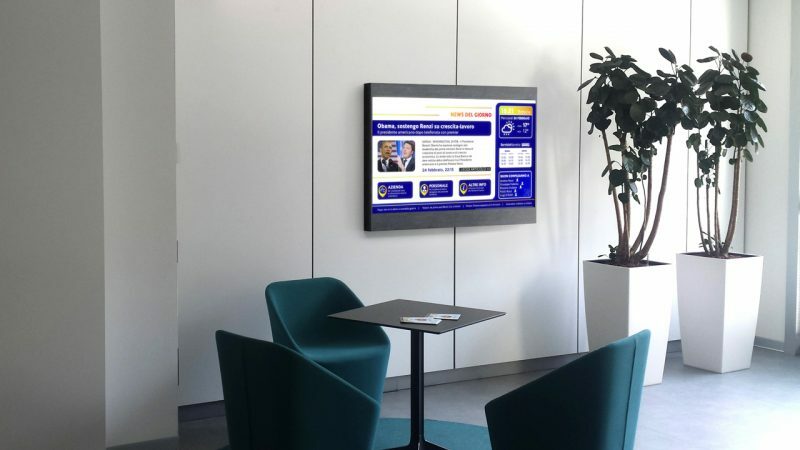 Using digital signage solutions in common areas, refreshment areas or waiting areas helps to create greater employee involvement and a better business climate. Studying the situation enables the transmission of different messages, aimed at sharing objectives, policies and vision with all employees. In terms of internal marketing, digital signage becomes a powerful tool for training and information, helping to transform employees into brand ambassadors. The meeting rooms must provide participants with an increasingly complete suite of technology, starting with systems for video conferencing, file sharing and synchronisation. In this case, digital signage is no longer a piece of furniture through which to transmit targeted messages. The most advanced organisations choose tables or entire interactive walls that guarantee a better view of content and much more. Texts, images, videos, projects, reports and so on can all be shared in real time. In addition, artificial intelligence now makes it possible to dictate notes that are translated into the language of each participant, which greatly facilitates corporate relationships. The office today has changed vastly in terms of layout, aesthetics and functionality. Many workplaces have become open spaces to foster collaboration and a more horizontal corporate culture. Start-ups, in particular, are creating fun and alternative work spaces and taking advantage of the Workplace 4.0 concept to find new ways to inhabit the office. Digital displays, in addition to adding a touch of modernity, remove the need to use traditional furnishing elements such as generic posters or paintings. Communication windows and digital signage solutions help people to stay connected. And any external visitor will perceive the environment as evolved and technologically advanced.